As I try to find the time to marathon Puella Magi Madoka Magica in an attempt to avoid any more spoilers, I had to stop to write about episode seven, in which allusions to and mentions of Christianity are far stronger than in any other episode to this point of the series. Though a few bloggers briefly mentioned the issue, I didn’t read anything in-depth (please let me know if I missed someone’s analysis), so I thought I’d have something to add. Early in the episode, Sayaka and Kyoko, whose personality and background get far more fleshed out in this episode, discuss the idea of the pact that the girls agree to. They exchange their souls for a miracle. What’s interesting is that this is very much like Christianity, but in a warped way. While Sayaka is pained by and later begins to regret her decision, feeling she’s given up her soul for a miracle (and a relatively trivial one at that), Christianity emphasizes that we give our lives to Jesus when we receive the miracle of eternal salvation. The ideas are similar, though the feelings associated with the transfers are drastically different. Now, for the meat of the symbolism. Kyoko leads Sayaka to a church and begins the temptation. A church is typically used as a moody setting for a scene (episode 5 of Cowboy Bebop comes to mind), but as should be expected of this high quality show, it becomes much more than that. It also emphasizes the fact that spiritual issues are also at hand. Also the Apple is becoming synonymous to Kyoko in the way that she is like Eve, who took the Apple from the tree and thus doomed mankind to sin, or in her case, her greed for a miracle from Kyubey doomed herself and her entire family. The Eve comparison is a good one. Kyoko is fiery and dangerous, fitting with the image of Eve that’s developed over thousands of years. And Sayaka stands ready to accept the apple, which is the fruit that typically represents the one given to Eve. Her acceptance will lead her into sin. But I think there are roles that are even more befitting of Kyoko and Sayaka. Instead of Kyoko, it is Sayaka that fits better into the image of Eve, while Kyoko is more like Satan. Remember, Eve gives the apple to Adam, but she is initially convinced by the serpent to take it. Kyoko tempts Sayaka with both the physical apple and the spiritual one – as Satan convinced Eve that eating of the fruit would open her eyes, Kyoko tries to open Sayaka’s eyes to her ideas about Puella Magi looking out only for themselves and not for others. And as Satan’s ideas were irresistible, Kyoko’s make sense as well – helping others has led to her ruin and seemingly to Sayaka’s. Why not look out for number one? Note in Kyoko’s backstory, she starts out as a innocent child – wasn’t Satan once an angel? He, too, was God’s creation before going wrong. Throw in some apparently “wrong teachings” (she says they were common sense…but we don’t know if that was true or the optimistic view of a daddy’s girl), and a transformation from angel to demon begins. Sayaka’s answer to Kyoko, of course, doesn’t fit into any mold relating to the Garden of Eden. It does, however, fit well with another demonic temptation – that of Lucifer and Jesus in the wilderness. At the beginning of Jesus’ ministry, He went on a 40-day fast in the wilderness, where He was tempted by Satan. Jesus was able to resist. Sayaka, too, passes her test, deciding (at least at that moment) to fight for others. Kyoko’s response is unsurprising – she is angry, especially when another Biblical scene occurs. Sayaka asks Kyoko where she got the apples, and receives no answer. In turn, Sayaka basically says that she will do what she will, as a non-response to the non-answer. This is reminiscent of Jesus refusing to answer the Pharisees’ question when they refused to comment on John’s baptisms (21:23-27&version=NIV">Matthew 21:23-27). We’re also left to wonder about the apples – were they possibly stolen or taken by force? As Puella Magi don’t make money and Kyoko has no family, it’s possible that the apples were taken by underhanded means. Thus, even in her presentation of the the right way to live life, Kyoko’s foundation is marred by sin – very much like the temptations by Satan in the wilderness. The rest of the episode marches on like a bizarre retelling of the gospel. Sayaka is betrayed by her friends (Hitomi could represent Judas or Peter); she marches on toward death, in spite of the pain she’s feeling; and she goes the final road alone, although others watch in the background. Of course, Sayaka’s attack on the witch is marked by a crazed personality after her transformation, making this gospel imagery very strange indeed. All this in 22 minutes…and I didn’t even discuss the teachings of Kyoko’s father or the temptation by another Satan-figure, Kyube. Perhaps that’ll save for another post. Edit: Since writing this post, I’ve completed the series. No need to avoid spoilers. Frankly I doubt that Urobuchi knows the Gospels as well as to make this reference. I think the symbolism here is supposed to be “apple = fruit of temptation”, everything else is a forced interpretation. Well, I wouldn’t say anything is forced. Interpretation is interpretation. Good interpretation doesn’t have to be truthful to what the author or creator intended – it just has to be supported well. Ah, yes, Kyoko. This episode is the one that starts to change the audience’s attitude toward her, as we see that she has a heart and isn’t as selfish as we were led to believe. And yeah, Sayaka was not nice to her at all. Speaking of christiannity, did you notice that Sayaka acts like a fundamentalist? For example, the way she divides things into good/bad without compromise or how she sees herself as a force of good. The problem she has with Hitomi is more the fact that it forces her to see that her wish was ultimately selfish and it doesn’t correspond with the image she has of herself. That’s why it hurts so much. THAT is a really interesting comment. Sayaka definitely divides good and right without compromise and sees herself as totally right. She is unwilling to listen to either Kyoko or Madoka. Thanks for the interesting insight! Sayaka was an example of a good girl gone wrong, highly reminiscent of the prosecutor Harvey Dent in The Dark Knight, who believed himself to be righteous and a noble “white knight”, without knowing that his crusader tendencies, driven hard by the nemesis Joker, led to his downfall and, as he loses his sanity and thus corrupting him with the loss of judgment, Dent devolved into Two-Face. Harvey Dent! Ooooh, I love it. That is a perfect comparison. Thanks for mentioning it! Isn’t this cristianity into this series a bit farfethed? I just see at as a series that’s amusing to look at. Ok it had it’s sad scenes and all. But in almost every anime there’s a girl with a cross/bible thing going on. Haha, no – no offense taken. But again, this series very strongly conveys Christian themes and symbolism. The apples were particularly emphasizes in this episode, and I would be very surprised if the creator didn’t intend to evoke images of the garden of Eden. Churches, crosses, etc. – those are typically used to convey gothic, dark, or mysterious tones – but the fruit was an obvious attempt to tell us something. The episode 12 has far far far more in common with buddhism. If you read my post on that episode, you’ll note that I mention as much. We’ve also linked to the varied posts by others discussing the connection between Madoka and religion. Our intent here is rarely to say that a series means to reflect Christianity, but rather to explore Christian themes on anime, intentional or not. I enjoyed reading your interpretation, and I think the creator definitely had the temptation in mind. At the same time, (and I am the guiltiest of this myself), we often try to interpose references too much onto another story. Often, medieval theologians would interpose parables with old testament stories and create bizarre conclusions (e.g. of the Good Samaritan: The man was Adam, and the moon was … the snake? variability? (the details of which I no longer recall). We saw that the script writers had Christianity in mind with the ending and the day the anime was released. However, maybe interposing the life of Jesus onto her story may be excessive. However, I do not know. Just plain speculations. They make for interesting reading nevertheless! You’ve got a good point. I want to bring up, since this is apparently becoming a point of objection among some readers, that I’m usually careful to avoid inferring that the creator of a series or movie MEANT something. Even with the final episode of Madoka being released on Good Friday and even with the seemingly obvious symbolism with Madoka’s decision, I’m still careful about implying that a connection was meant since I know little about him and because Japan has such a small Christian population. My intent is to add a layer of meaning, usually never intended by an animator, to various series, and to discuss the themes/symbols/stories/etc. that I’m conveying. Through that, I hope that readers will think about these messages and perhaps be able to “see” the invisible God in various medium, even anime. And I did not meant it to be a criticism, rather an observation and a thought. I find your goal of revealing another way to interpret anime to be the thing that draws me to your blog time and time again, though. This is an interesting site:) I’m not a religious person myself, but i think the connections you make are insightful; so thank you for the reading material. Hm…interesting. A piece of art can be interpreted in many ways. Now that I mentioned that, I think that’s a reason as to why an artwork’s message isn’t necessarily what the author thinks. The meaning changes with time and culture. One person can be reminded of this, while the other can be reminded of something different. Well, what’s important is that we respect each others’ beliefs. Everyone has free will, therefore a person cannot force someone to do something that they want, unless that someone decides to do what the person wants. Isn’t it interesting how pieces of work can take so many meaning, and such different kinds, depending on the person/culture observing it? 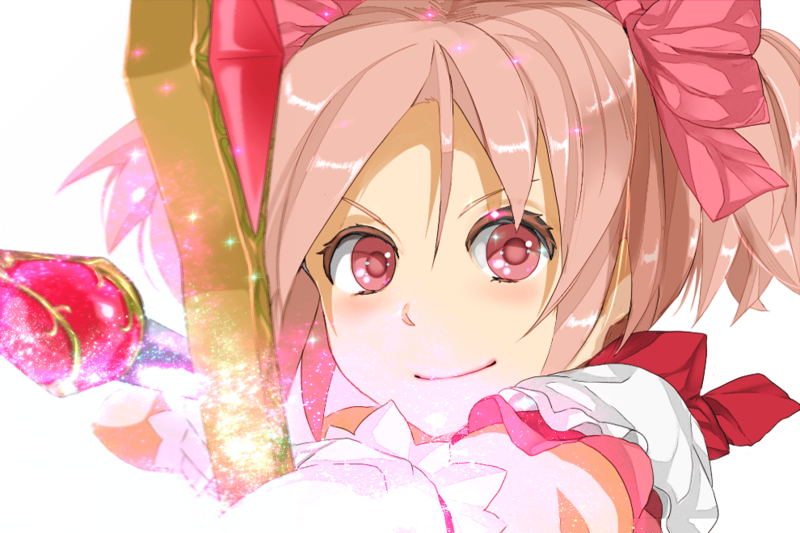 Madoka is certainly a good representation of this. I agree that we should all respect each others’ beliefs, and that’s an idea I hope we emphasize in this blog. One thing to consider is that Madoka is deliberately using Christian imagery to evoke Christian themes (as filtered through a Japanese viewpoint). Because of this the Christianity presented is very stilted, filtered through the perception of a non-Christian in Japan, and an odd melding of Catholic and Protestant textures. Still, it was a deliberate Christian message. And it was no accident that Kyoko was presented as a lapsed Christian. I would say that I wasn’t aware of Urobachi’s purpose and thought process when this post was first written (around the time episode seven first aired), but truth be told, I didn’t know that now, either (and I’ve forgotten most of what I’d previously read about PMMM). Thank you for the information!